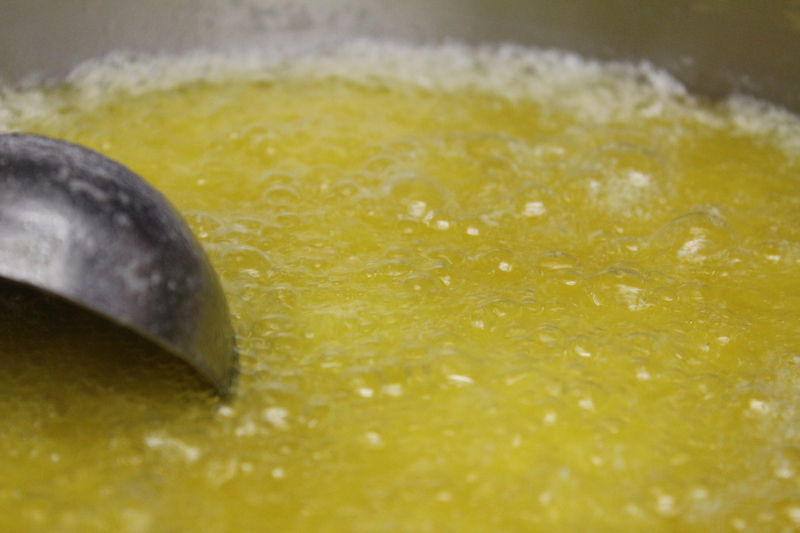 Anyone who has had Indian food (North or South) knows that ghee (clarified butter) is an important ingredient. In North India, breads are usually tempered with ghee and in South India, rice preparations are normally served with ghee. A small amount of ghee daily ensures good lubrication for the body. Remember that all the cells in the brain are made of fat cells…so inclusion of good fat is essential. The key word being “good fat”. I am very paranoid about buying non-organic dairy products, especially since growth hormones are often found in non-organic dairy. So making my own ghee at home is the sure and economic way to have organic ghee. 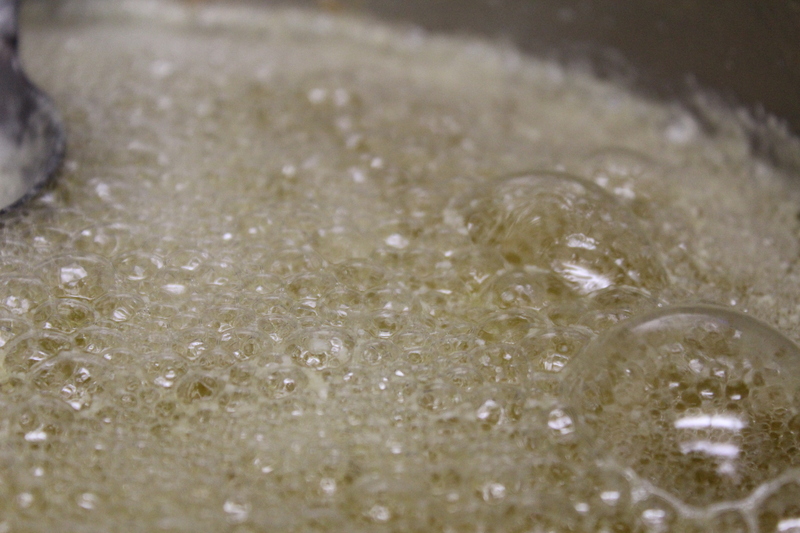 In this blog, I want to share my process of making ghee. Before we start, I have to warn you all…this process requires the utmost attention. So you have to be completely dedicated to making the ghee. The process doesn’t take more than 15-20 minutes, but no multitasking during this entire time! If you think you might be distracted, then postpone it until you have the dedicated 20 mins. OK, now let’s start. Open all the 6-8 sticks of unsalted butter and let it melt in medium heat. You can keep scooping melted hot butter onto the solid butter sticks to melt the butter quickly. Keep the heat on medium throughout the process. Once all the butter is melted, it will look something like this. Very shortly, you will hear the butter crackling. 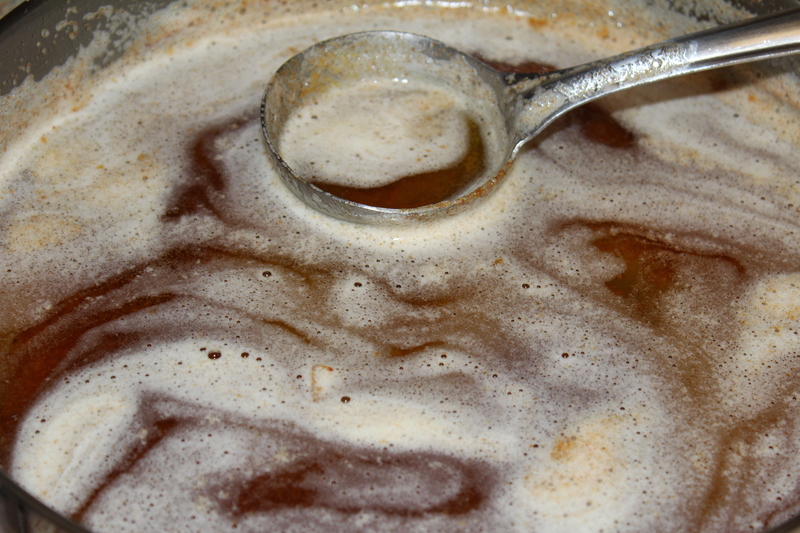 Keep stirring it to avoid butter boiling over. At this point, it will look something like this. Keep stirring and soon the butter will start frothing. You will continue to hear the crackling. That is normal and a sign of good butter. If the butter is not of good quality, you normally don’t hear as much crackling. I have seen this myself. 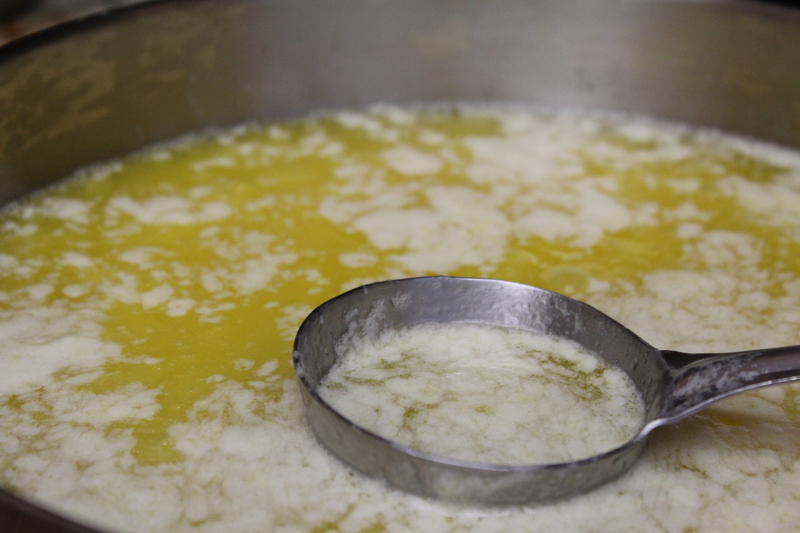 If you smell the ghee at this point, it will smell salty (like the sea). Again keep stirring and let the frothing continue until it starts to get clear and the noise dies down. At this point, you have to make sure you are focused. Because after this, very shortly you will have to remove the ghee from the heat or it will burn. I am providing some pictures below to show you the progression. Now at this moment, your ghee is done. Remove it from the heat and it will brown a bit more. 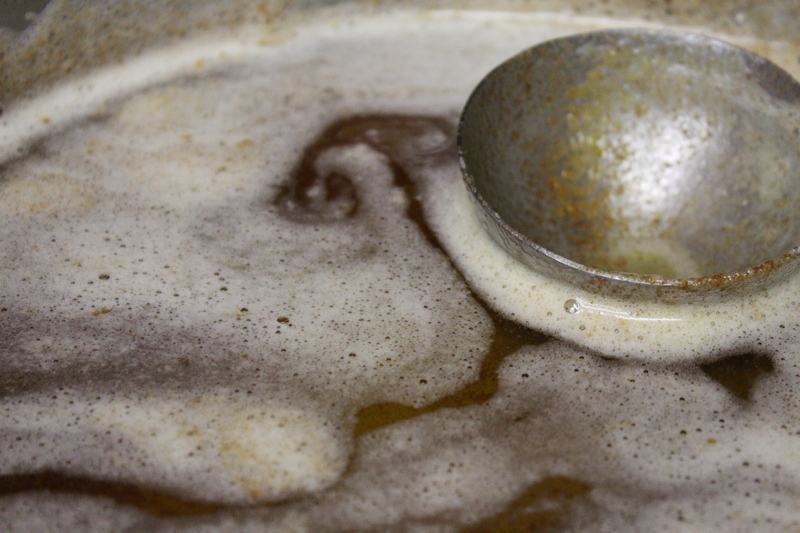 If you like your ghee to be clear white, then you can pour it into any container to avoid further browning. 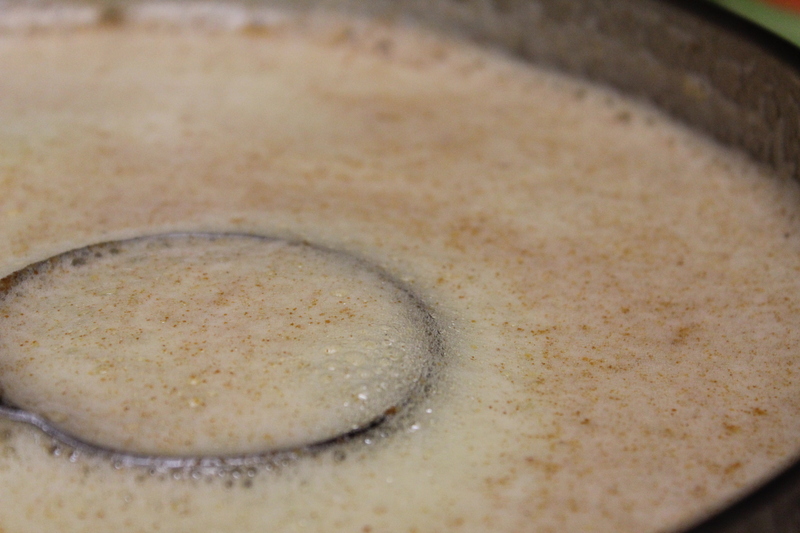 But I like the slight brown tinge, so I just leave it in the pan and the ghee looks beautiful. Also it smells absolutely divine, very sweet. After the ghee cools, I strain it into a container and use it as needed. Straining is necessary since there is a bit of crud left over that you don’t want to use. Throw the crud away and enjoy homemade pure organic “Desi Ghee“.